LittleBigPlanet Vita doesn't come out for another couple of weeks, but Sony has decided that they don't mind if we go ahead and talk about it now. How nice of them! I'm taking my time playing it—LittleBigPlanet games have a lot of nooks and crannies, and I'd like to explore every one before I do a full review of the new portable version. I've played about six hours; I'm about halfway through the story, but I've also spent a lot of time playing minigames, going through downloaded levels, and taking a crack at making some levels of my own. LittleBigPlanet creators Media Molecule aren't directly responsible for the portable incarnation of LBP—that duty has fallen to Tarsier Studios. But LBP Vita still feels very much like a LittleBigPlanet game. Too much, at times, in fact. 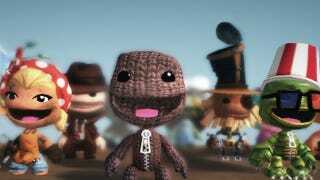 That may be why Media Molecule moved on; LBP 2 was in many ways the ultimate version of LittleBigPlanet. That game that featured so much depth and variety that there was almost nothing left to say. Fortunately, if you liked LittleBigPlanet 2 (which I did) then you'll feel right at home with LBP Vita. It may lack a bit of LBP 2's verve, but it's still got that great handmade feel, those goofy physics, and that lovely (though sometimes annoying) narrator. You know how history teachers talk about how the indigenous people of the American west used "the whole Buffalo"? Well, LittleBigPlanet Vita uses the whole Vita. You'll use the front and back touch pads to move objects in the world, stretch back springboards, use the accelerometer to slide yourself around and even use the rear-touch pad to guide flying vehicles. It all even manages to occasionally (maybe even frequently) transcend that "We're doing this because it's a Vita game and we have to" feeling that so many of the Vita's launch titles suffered from. Some of the touch implementation is really well done and fits well with the lived in, physical nature of the LBP world. Other things do feel gimmicky, and some of the touch-screen stuff just isn't responsive enough. But overall, the touch-screen controls feel organic and of a piece with the whole LittleBigPlanet "thing." This is particularly true in the menus—it's actually to the point that I don't think about using touch controls anymore. There are so many menus and options and do-dads in the game, and navigating them with the Vita's touch-screen feels natural and intuitive. Rotating the globe to choose a level, tapping on a level to load it, flipping through the pages in my poppit—those things all work even better than they did in LBP 2, almost as though LBP 2 should've been designed with touch in mind. As much as LittleBigPlanet is ostensibly a game about physics-based platforming and user-generated content, it's always felt like a very musical game to me. I can't think about LittleBigPlanet 2 without hearing its amazing hodgepodge of a soundtrack. It was one of my very favorite soundtracks of 2011, and I still listen to tunes from the game when I work. So far, LBP Vita's soundtrack doesn't measure up to its console big brother. The music is… fine, I guess, but it's all the same kind of repetitive instrumental stuff, and each world doesn't have that much variety going on. Levels still do that nifty trick where the parts layer on top of one another as the levels themselves get more complex, but something's missing. There also doesn't seem to be very much licensed music—I'm not holding my breath for a Shostakovich boss battle. There's no question that LBP 2 spawned some fantastic user-generated levels. But even those, as amazing as they were, were sort of a lark—they didn't feel all that chunky, and for me anyway, they didn't really extend the life of the game beyond some cursory "Oh, ok, let's look at a few good downloadable levels!" Online discovery is still a bit of a chore in LBP Vita, by which I mean that like LBP 2 it's hard to find truly great levels and impossible to quickly preview them without spending a lot of time loading them and checking them out. That said, there are already a bunch of funny one-off "joke" levels in the game, and I'm sure some enterprising souls will make plenty of even better ones. "It's very much LittleBigPlanet" also means "It still controls like a wet sack of sand." The game still puts physics first and control second, meaning that you're kind of throwing yourself through levels. After spending a bunch of hours guiding the empowered, cat-like protagonist of the stellar Mark of the Ninja, it's been hard to really enjoy coaxing silly ungainly Sackboy around a level. With all its bouncy physics and mechanical wit, LittleBigPlanet Vita certainly moves well, it just doesn't feel all that good. Jury's still out on this, since the level-creation is definitely one of the deepest and least accessible aspects of LittleBigPlanet. I think that when it comes down to it, I'm just not a level-maker, but I do enjoy looking at how LBP makes it possible for people to make their own levels. Considering how huge and ridiculous the game has become (see: The next part on the minigames), it's almost galling that they'd expect people to make workable levels using only the Vita's controls and not a mouse and keyboard. But where there's a will, there's a way. The touch-screen is indeed the most versatile and useful new tool in a level-maker's arsenal, far more practical than the PS Move was on consoles. I may not be ready to make my own Mario tribute level, but the touchscreen stuff makes it that much more likely that I will be soon. LittleBigPlanet Vita's "story globe" contains a separate city called the arcade, which holds a group of mini-games. I haven't unlocked all of them, but the ones I have unlocked are all touch-screen games, and they're all surprisingly fun. It's almost like having a little iPhone-game factory inside your Vita. All of the games were made using some of the high-level new building tools, including the ability to track your progress and move you through a series of minigames level by level without losing your place. It's all fun, and makes for a nice diversion from the platforming stuff. It does, however, remain to be seen if once the novelty wears off, we're just looking at a bunch of knockoff iPhone games buried within a Vita game. I'll have more on LittleBigPlanet Vita , including a full review, before the game launches on September 25.